MOSCOW, Idaho – Idaho fashioned its first Big Sky Conference football victory since its return to the conference after 23 years away, wearing down Portland State 20-7 on Saturday. The Vandals did so purposely, enthusiastically, and with flash at times. “It was a great team win,” Vandals coach Paul Petrino said. It improved the Vandals to 2-2, 1-1 in the Big Sky. PSU fell to 1-4, 0-2. The Vandals built a 20-0 halftime lead that included 18- and 13-yard drives that led to Cade Coffey field goals. On those marches, Idaho played methodically and carefully. In the first series alone, the Vandals used a pair of timeouts. They also benefited from a Vikings timeout and a media timeout. Idaho’s first touchdown came when quarterback Mason Petrino hit Jeff Cotton for a 7-yard touchdown. A second touchdown came after Jalen Hoover blocked a Vikings punt that Lloyd Hightower returned 32 yards for a score. Just as impressive, when the Vikings made a bold attempt to get back in the game on the first drive of the third quarter, the Vandals gave up a touchdown but shut out PSU after that. On the series, the Vikings converted a fourth-and-2. Three plays later, quarterback Davis Alexander sprinted right and hit Davis Koetter, sliding in the end zone for PSU’s lone score, cutting Idaho’s lead to 20-7. But the Vandals didn’t lose momentum. “The guys kept fighting, running around,” Petrino said of his defense. On the series before Hoover’s blocked punt, Idaho pinned PSU at its 12-yard line. Punting from his end zone, Ben Niesner leaped and stabbed desperately at a high snap, tipped the ball to himself and raced 27 yards for a first down. It could have been deflating, but the Vandals stiffened and forced a three-and-out, and Hoover laid out to smother Niesner’s second attempt at a punt. Defensive end Kaden Elliss, with 1 1/2 sacks in the game, said he and his brother, middle linebacker Christian Elliss, competed with each other for tackles and pressuring Alexander. Hightower added a crucial third-quarter pass break-up for Idaho in addition to returning the blocked punt. Isaiah Saunders, the game’s leading rusher with 99 yards on 22 carries, had success against the Vikings behind a fullback for a pair of fourth-and-short conversions. Saunders also set up Petrino’s touchdown throw to Cotton with a 34-yard burst to the Vikings’ 5-yard line. On the score, Petrino rolled right and Cotton shadowed him across the end zone, losing pursuing cornerback Deon Crayon and getting free for the catch. The Vandals had tried the same play in the first half with similar results, Mason Petrino pointed out, but the score was erased by a penalty. 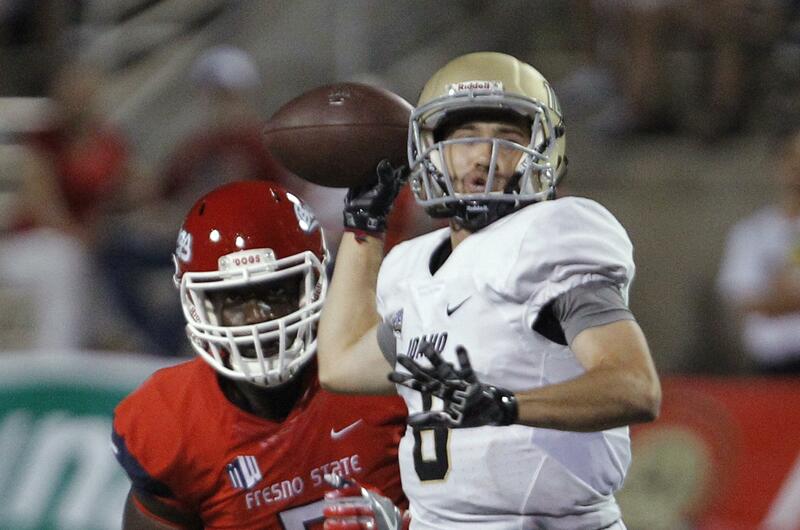 Saunders’ big game was of enormous benefit to the Idaho offense, Mason Petrino said. “When Smooth gets going, we all get going,” he said. Mason Petrino went the whole way at quarterback for the first time this year. He and Colton Richardson had been alternating at the position. Richardson, though, injured his throwing hand a week ago at UC Davis and missed several days of practice this week. Richardson was dressed to play and warmed up, but coach Petrino said the game was close enough he did not want to insert Richardson. Mason Petrino completed 17 of 24 passes for 166 yards with a touchdown. Published: Sept. 29, 2018, 10:01 p.m.